There are so many great examples of clever email marketing or even simple relevant email marketing from companies that are obviously getting it right. Unfortunately there are just as many companies getting it wrong, such as the basics of email marketing: the FROM name and from and reply addresses. eMarketing Insight discusses these 3 basic elements that help make that visit into the customer’s inbox a worthy one. Customers open emails from brands they know. An email sent from an individual, instead of the organization can easily damage your brand as well. Take note: The FROM name is important for all emails. Far too often, automated emails are completely forgotten and as you can see from the example below, will quite easily get lost in the crowd of email with the same non-branded FROM names. Emails may be sent in bulk, but are often perceived to be a two-way communication channel. The recipient may want to respond by simply clicking reply. Far too often though reply addresses don’t work or they are unmanned, leaving a frustrated customer on the other end. This may lead to them unsubscribing or worse, hitting the junk-mail button. Many customers will use the reply option as a means to unsubscribe – let them. It’s better than having them mark your email as junk-mail. Take note: Allowing customers to reply is great for customer service and fantastic for deliverability. When customers reply to emails, it registers as engagement at some webmail providers like Yahoo! Gmail and Hotmail. If your engagement is high, your inbox penetration will also be higher. Not enough time is spent thinking about the FROM address. Considering that this address is often displayed in email clients, it should be higher up on the priority list. The FROM address is the email address that is displayed next to the FROM name in email clients. By not testing that automated email and it comes from nobody@example.com, or a long FROM address via another address displays next to your brand, that personal interaction with the customer goes flying out the door. Take note: When the FROM address mimics the reply and the FROM name hasn’t been set up correctly, you are also in a situation where that email address will display in the FROM area. See the example below. It really screams ‘we just don’t care’ – doesn’t it? 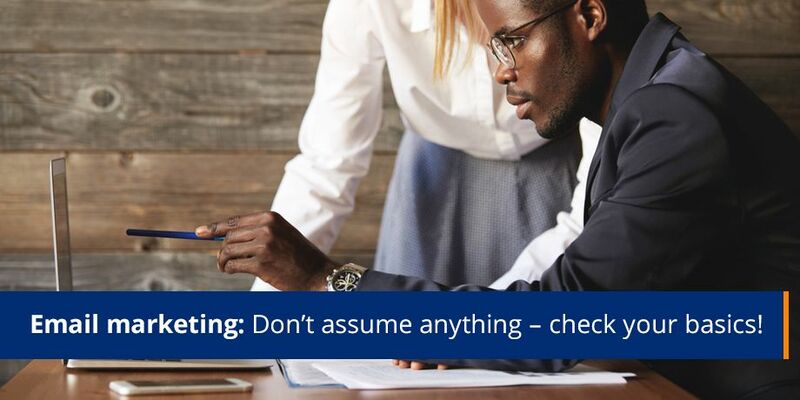 Don’t assume anything – check your basics! Take time to get the basics right, as they will impact campaigns and the experience the customer has with your brand in their inbox. Test every email leaving the organization – including those automated emails everyone just assumes are right.